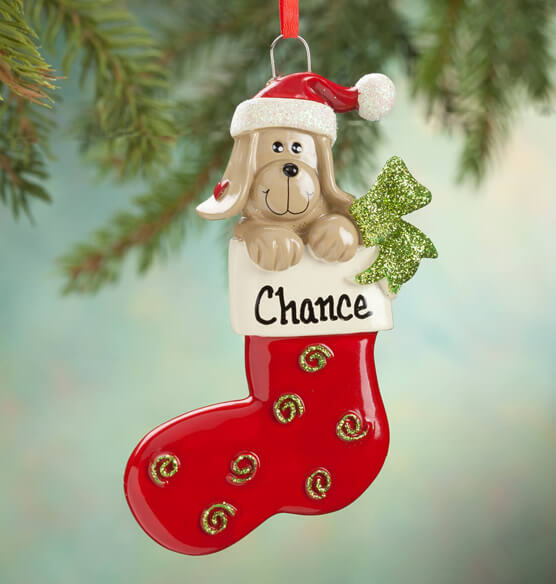 This personalized Happy Pup Stocking ornament celebrates the top dog on your "nice list" ... arriving personalized for an added treat! Wonderfully detailed with sparkling glitter accents, our pet-loving Christmas ornament is dog-gone darling. We'll add one happy pup's name at no extra charge, creating a keepsake treasure. Specify name; limit 1 line, 8 letters/spaces. Resin. Unique ornament measures 2 1/2" long x 4 1/2" wide. Such a cute stocking ornament that you can personalize!